However, this new dynamic of the “developmental state” project evoked various debates among scholars, of which its compatibility with the constitutionally entrenched ethno-federal model became the prominent one (Asnake and Fana, 2014; Clapham, 2017). [viii] Thus, it is not yet clear to what extent the Ethiopia’s ‘’developmental state’’ projects coalesce / contradict with the provisions of ethno-federalism and as to how do they (re) configure power relations between different scales of actors? The purpose of this PhD project, hence, is to understand the notion and practices of ‘’developmental state’’ in Ethiopia, by drawing on a case study of the Gibe III hydropower development project from multi-scalar perspectives. As the Gibe III hydropower project is one of the most ambitious and controversial schemes that embodies the essence of the ‘’developmental state’’ paradigm (Abbink, 2012; National Planning Commission, 2016), it is believed to be an appropriate prism to understand the politics of Ethiopia’s ‘’democratic developmental state’’ in its whole materiality and historicity. The study follows a qualitative case study research approach (using semi-structured interviews, formal and informal discussions, site observations and document analyses) and employs a less deterministic (broader) analytical framework informed by insights from state modernism, political ecology and developmental state theory to address a complex set of multi-scalar implications associated with the Gibe III hydropower development project and then connect it to Ethiopia’s state developmentalism, state-making and related governance issues through the prism of this project intervention. To this end, during my first year (2015/16) in France under supervision of Professor David Blanchon (Université Paris Nanterre) and co-supervision of Dr. Sabine Planel (French National Research Institute for Sustainable Development, IRD), I have tried to assess the state of the art in the state developmentalism, power and mega dams including on Ethiopia. After having a theoretical exposure, I conducted my first fieldwork from early July to the end of December, 2016, which focused on the governance of the Gibe III hydropower project (planning, designing, environmental and social impact assessments, compensation measures, operation and management, etc.) in term of the actors involved, the decision making processes and their implications. During my second year (2016/17) of study, although the research project was in its early year of progress, the fieldwork at national and local scales has yielded some preliminary findings, which was communicated in a seminar, workshop and international conference. In this regard, the first session of the fieldwork enabled me to realize, beyond the ‘’developmental state’s’’ modernist, depoliticized and top down development approach, the existence of contestations and various strategies used by the local communities to subvert the national project for their benefits. Accordingly, with the objective of a deeper engagement, I conducted a second round of fieldwork from the end of September to mid November, 2017, which brought the total number of the accessed research participants to eighty-eight project affected peoples in eight villages of the surrounding three Weredas (districts) such as Loma (Dawuro Zone), Kindo-didaye and Kindo-koyisha (Wolaita Zone) at the dam site, and forty eight experts and officials (from those institutions directly/indirectly involved in the project related decision-makings) in both sessions of the fieldworks. The current session gave more emphasis on the politics involved among various actors in the planning and implementation of different components of the project (construction of Roller Compacted Concrete dam and reservoir, Sodo-Chida realignment road, and Ethiopian Electric Power permanent camp and Gibe-Sodo transmission line development projects) and the nature of the reactions at the local project interface from the broader state-society relations perspective. Subsequently, I will proceed to carry out an in-depth analysis of the collected multiple field data and understand as to how the Ethiopia’s “developmental state’’ operates/ exercises power and with what effects through the prism of the project under the study. A side view of the Gibe III hydropower project at the dam site (Source: Field work, October 2016). A partial view of the Ethiopian Electric Power permanent camp-Gibe III hydropower project, Zaro Kebele, Kindo-didaye Wereda, Wolaita Zone (Source: Field work, October 2017). 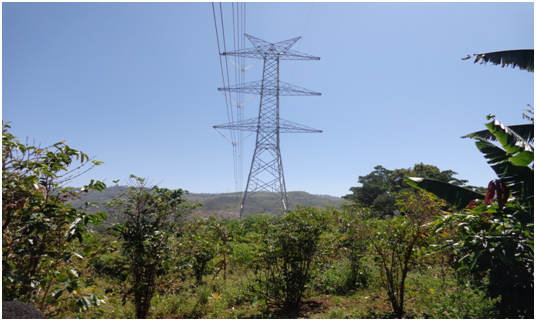 A view of Gibe-Sodo 400 Kilovolt power transmission lines-passing over a residential garden that damaged uncompensated perennial crops, Bade-wayide Kebele, Kindo-koyha Wereda, Wolaita Zone (Source: Fieldwork, October 2017). [i] Abbink, J. (2012) “Dam controversies: contested governance and developmental discourse on the Ethiopian Omo River dam”, European Association of Social Anthropologists; Fantini, E. (2013) « Developmental state, economic transformation and social diversification in Ethiopia » ISPI-Analysis, no. 163, department of culture, politics and society, University of Turin; Lefort, R. (2015) “The Ethiopian Economy: Developmental State vs Free Market” in Gerard and Fiquet eds. Understanding Contemporary Ethiopia: Monarchy, revolution and the legacy of Meles Zenawi, New York : Oxfored University Press. [ii] Assefa Fiseha. (2014) “Development With or without Freedom?” in Desalegn R., et al. (eds) Reflections on Development in Ethiopia, New trends sustainability and trends, Addis Ababa: Forum for social science, 67-96; Hagmann, T. and Abbink, J. (2011) « Twenty years of revolutionary democratic Ethiopia, 1991 to 2011 », Journal of Eastern African Studies, 5 (4): 579-595. [iii] National Planning Commission (2016), Growth and transformation plan, 2015-2020, Addis Ababa, Ethiopia. [iv] Scott, J.C. (1998) Seeing like a state: How certain schemes to improve the human condition have failed. New Haven: Yale University Press. [v] Ferguson, J. (1994) The Anti-Politics Machine. ‘Development’, Depoliticization, and Bureaucratic Power in Lesotho, Minneapolis, MN: University of Minnesota Press. [vi] Planel, S. (2014) « A view of a bureaucratic developmental state: local governance and agricultural extension in rural Ethiopia, » Journal of Eastern African Studies 8 (3): 420–37. [vii]Abbink, J. (2012) “Dam controversies: contested governance and developmental discourse on the Ethiopian Omo River dam”, European Association of Social Anthropologists; Gascon, A. (2008), “Shining Ethiopia: l’Ethiopie post communiste du nouveau millenaire”, Autrepart, no. 48: 141–52. [viii]Asnake, K., and, Fana, G. (2014) « Expansion of the Sugar Industry in the Southern Pastoral Lowlands » in Desalegn R., et al. (eds) Reflections on Development in Ethiopia. New Trends, Sustainability and Challenges, 247-286; Clapham, C. (2017) ‘’The Ethiopian developmental state’’, Third World Quarterly, DOI: 10.1080/01436597.2017.1328982 (access on 08/11/2017).